At the event, Alibaba Cloud debuted its impressive strategy into the Internet of Things (IoT) market and announced its collaboration with Zhejiang Provincial Company of China Unicom to jointly deploy a LoRaWAN™ network based on Semtech’s LoRa® devices and wireless radio frequency technology (LoRa Technology). At the signing ceremony, I joined Wei Ku, Vice President of Alibaba and General Manager of IoT Business Unit of Alibaba Cloud and Yongxin Zhong, Vice General Manager of the Zhejiang Provincial Company of China Unicom. Both expressed their confidence in LoRa Technology based on its widespread acceptance and integration into millions of devices. This joint deployment further emphasizes LoRa Technology as a de facto IoT low power wide area network (LPWAN) standard and will continue to drive more adoption in China. China’s LoRaWAN-based city area networks will be deployed by the Zhejiang Provincial Company of China Unicom in Hanghzou and Ningbo. Alibaba Cloud will support the effort by establishing a large ecosystem of LoRa-based sensors, network gateways and servers. The networks are scheduled for go live in mid-2018. China continues to promote innovation and connectivity through IoT. 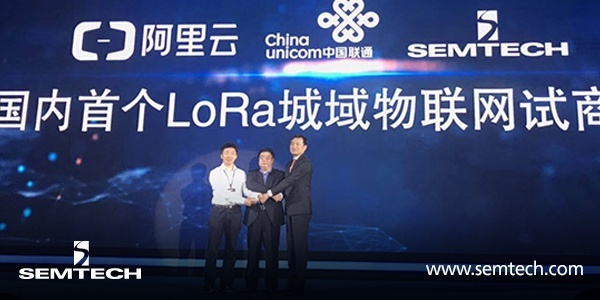 Through the adoption of Semtech’s LoRa Technology in China by Alibaba Cloud and China Unicom, there will be countless new use cases enabled in key verticals such as smart cities, smart homes and smart agriculture. The joint deployment will also enhance the consumer’s ability to utilize IoT applications. Ultimately, as the adoption of LoRa Technology expands throughout China, user’s will benefit from the streamlined access to IoT networks. Semtech looks forward to the collaboration with Alibaba Cloud and China Unicom with respect to the long-term development of IoT technology and applications in China. For more information on smart cities and smart agriculture use cases, download white papers now!